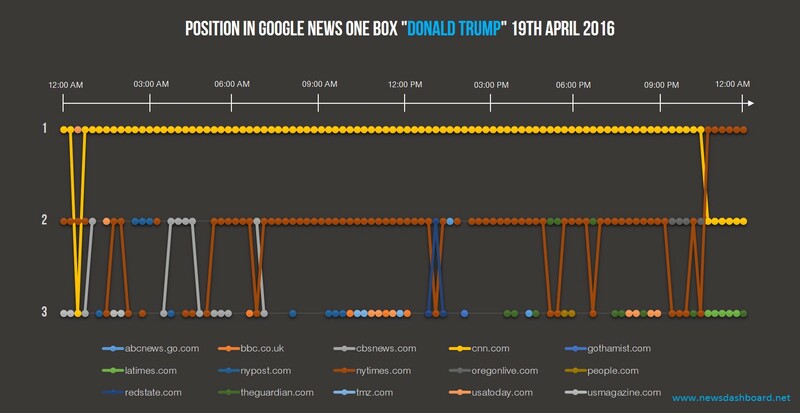 New York Primary and Google Traffic – Which News Publisher won the News Boxes? Hillary Clinton and Donald Trump won the New York primary. Both were able to increase their lead over their competitors even further. We took a look at the performance of American News Publishers in Google News. 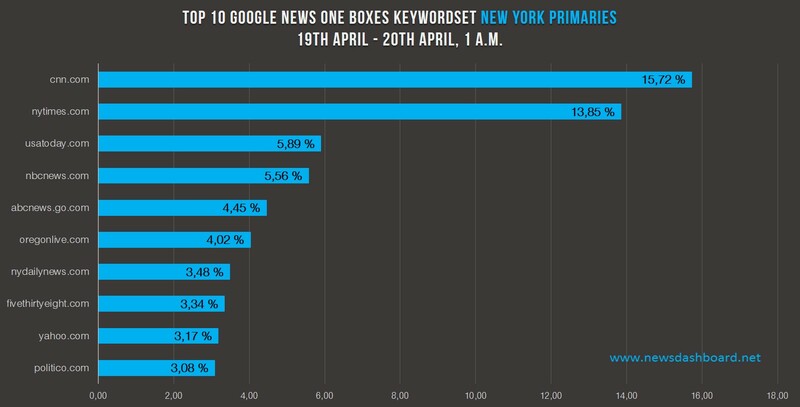 Which site won the Google News Boxes regarding the New York primary and took advantage of the corresponding traffic? We created a specific keyword set including keywords like “New York primary”, “New York primary polls”, “New York primary results” as well as the names of the Democratic and Republican candidates and additionally their names in combination with New York. All in all we had a keyword set of 14 keywords. In the following diagram we analyze all Google News Boxes of the keywords we took into consideration. We looked at the day of the election until 1 a.m. the day after the election (US East time). As you can see cnn.com and nytimes.com were the clear winners of the Google News Boxes. Usatoday.com and nbcnews.com, which are on third and fourth position, are clearly behind. While cnn.com and nytimes.com had a visibility in the Google News Boxes of above 15 and nearly 14 percent, usatoday.com and nbcnews.com could just reach a visibility of 5 to 6 percent. Nevertheless the news publishers on third and fourth position made a good job in Google News too. Surprisingly fivethirtyeight.com ranked not as good in the Google News Boxes as at the primaries before. The site is just on position eight with 3.34 percent visibility. If we compare these results with their results after the primaries on 15th of March, we see a huge difference. On 15th of March fivethirtyeight.com had a visibility of 8.25 percent and was on second position in the Google News Boxes. At the day of the New York primary the site was in the last third of the Top 10. Another striking fact is that oregonlive.com is in the Top 10. It is a local news site of Oregon which is at the west coast, far away from New York. Nevertheless the site reached very good results in the Google News Boxes. Let´s now have a look on two specific keywords. We analysed Google News Boxes for the keywords “Hillary Clinton” and “Donald Trump”, the winners of the New York primary. As we see in the diagram below, cnn.com was the clear winner of the Google News One Box of “Donald Trump”. Almost the whole day cnn.com ranked on first position in the Google News Box. On second position was Nytimes.com. Occasionally there were also some other news publishers in the “Donald Trump” News Box like nypost.com, cbsnews.com, usatoday.com or latimes.com. So cnn.com should have nice traffic from Google in the primary context. cnn.com ranks first in the Google News Box for “Donald Trump”. In the Google News Box of “Hillary Clinton” cnn.com was not that strong as in the “Donald Trump” one. The diagram below shows that there was some fluctuation in the Google News Box. There were four news publishers which could rank on first position for a longer time. In the night it was time.com, in the morning until noon nytimes.com, afterwards there were politico.com and cnn.com on first position. It´s obvious that we can´t identify one or two clear winners for this Google News Box. News Publishers like for example nypost.com, washingtonpost.com, usmagazine.com and theatlantic.com were also represented in it. They were – amongst others – on second or third position. There is no clear winner in the Google News Box for “Hillary Clinton”. To sum it up we can say that cnn.com and nytimes.com had the highest visibility in the Google News Boxes regarding the keyword set of the New York primary. But we found some differences after we had taken a detailed look at some specific keywords: although cnn.com and nytimes.com had the best performance regarding all keywords, they could not win the Google News Box of “Hillary Clinton”.